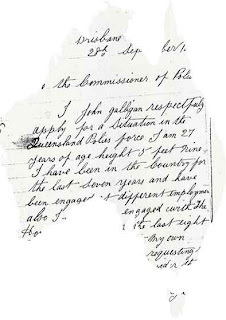 As part of the Twigs of Yore Australia Day suggestion to find the earliest piece of documentation about an Australian ancestor I have selected this letter written by my ancestor John Galligan in 1881 "respectfully applying for a situation in the Queensland Police Force". I first obtained this letter early on in my research after hearing from relatives that John had been a policeman. It came in reply to a letter I wrote to the Queensland Police Department. The covering letter to that reply said "I hope the material forwarded provides new data and further avenues for investigation." It most certainly has. John had worked for Hon HE Ring who was the speaker of the Legislative of Assembly (Queensland Parliament). At the time there were 42 members (there are now 89). Visiting the Queensland State Archives in 2009 I thought I may as well look at John Galligan's police file which I had seen in their index. My expectation was it would be the same as what I already had. Instead there were a few surprises including his application to get married to Miss Maggie Hudson residing with her father in Montague Road South Brisbane. This sentence has opened the door to new Australian & Irish research on the Hudson family. I love how a few unexpected words on a document can suddenly open doors to new areas of research! Thanks for your post, which I've only just seen. I've added it to the list at http://twigsofyore.blogspot.com/2011/01/australia-day-2011-all-challenge-posts.html. If you have some spare time and want to find out a bit about some of the incidents and cases that John was involved in, try doing a search for his name in Queensland Police Gazettes on CD-ROM. And Justice Department inquest files (at Qld State Archives) often include statements by local police - so try searching the typed indexes and card indexes to inquests (which list Fire Inquests) under the names of towns where he was stationed. Thanks for those tips Judy. I'll be blogging on some findings in newspapers on Trove but now you've given me some other ideas of where to look as well.